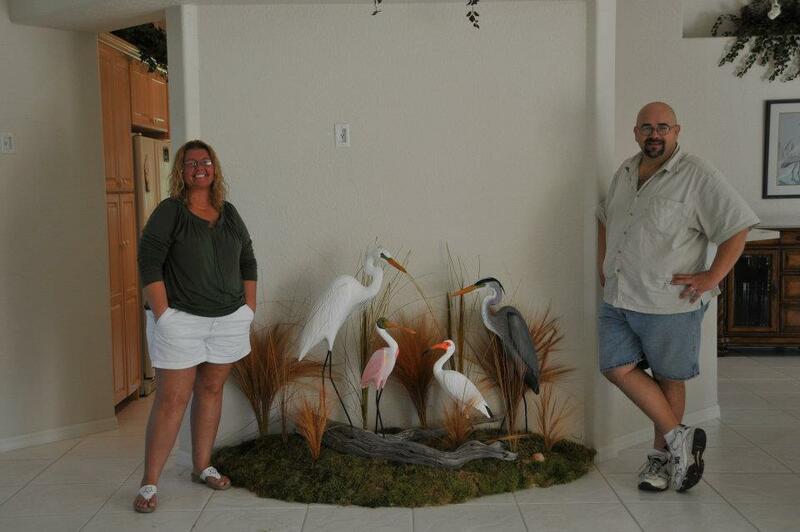 My wife Cindy and I with a custom grouping of our birds. We can create a custom base to fit your niche. First we create an original wooden bird carving and have a mold made to reproduce them in Limited Editions . 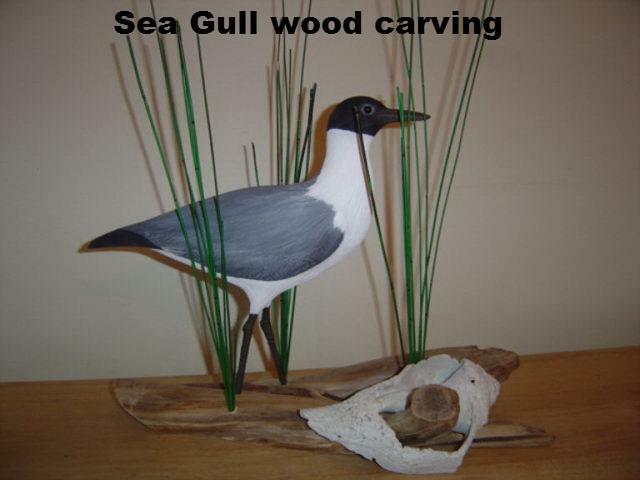 We have been creating wading bird wood carvings , statues and sculptures since the 1990's .We maintain the highest quality by doing the work in house we have no employees .We are a true Mom and Pop business . Cindy does most of the assembly and base coat painting and I do finish carved and painted details and mounting on unique wooden bases. All products that go into our sculptures are Made in America .The resins we use are good indoors or out. We stand behind our work and aim for 100% satisfaction. Each bird comes with a hang on card that tells about our work. Shop in confidence and we will create you an heirloom for you to pass on for generations. The Great Blue Heron is a large wading bird that is common near large bodies of water.The blue heron can be found over most of North America . An all white heron population can be found in the Florida Everglades . They were once thought to be a separate species known as the Great White Heron but DNA research has determined that they are merely a unique color morph of the Great Blue Heron . 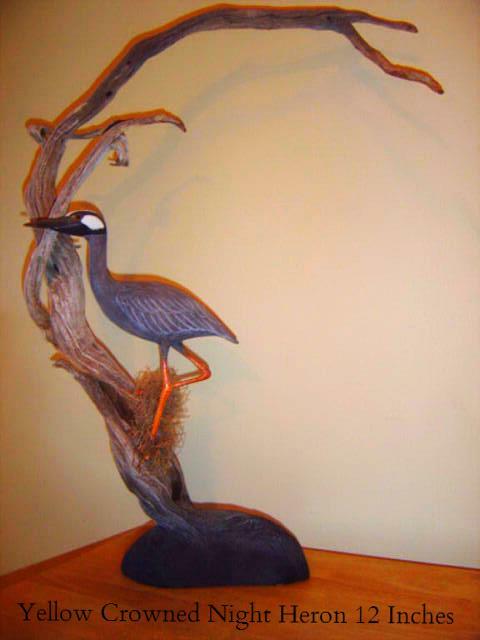 Yellow -crowned Night Heron (Nyctanassa violacea)Limited Edition of 500 This bird sculpture is 12 inches tall on a 1 of a kind base of twisted driftwood that blends into a black wooden base . This is my favorite piece of driftwood. 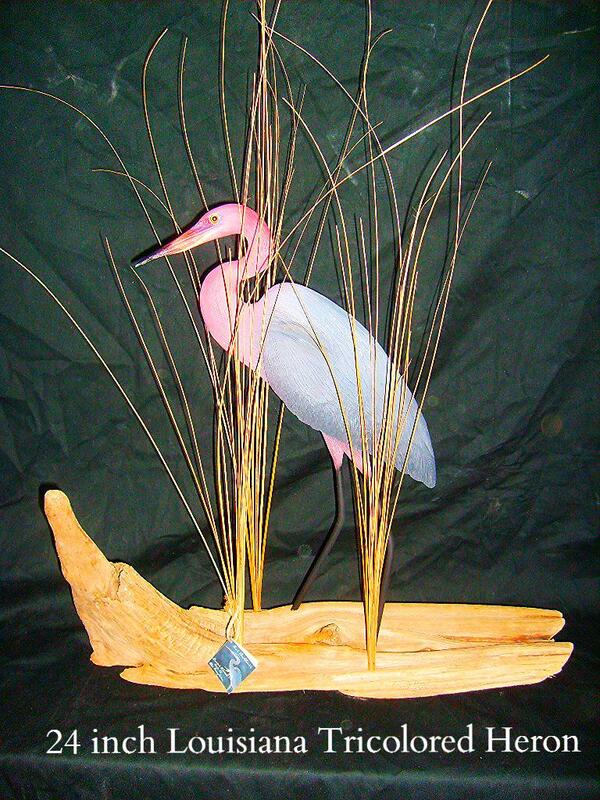 This piece as you see it is $400.00 It is available on a flat driftwood base for only $220.00 Call- 941-286-3299 to order. 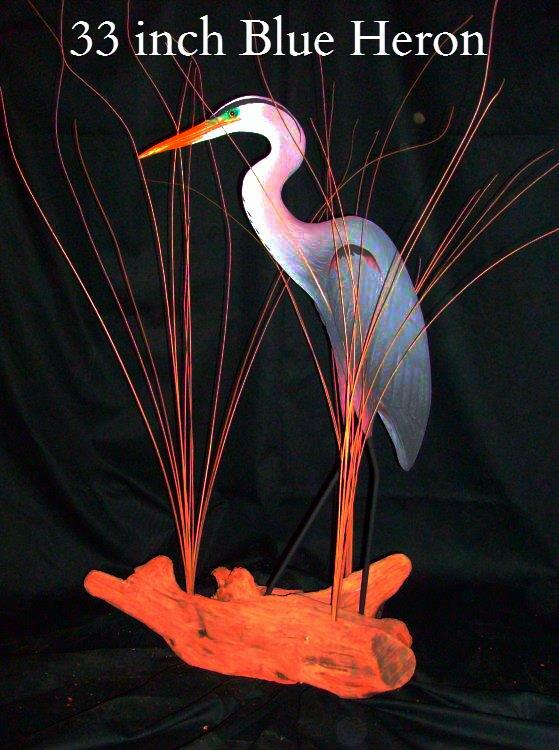 Louisiana tricolored ( Egretta tricolor)heron Limited Edition of 1000 24 inches tall on driftwood base with reed grasses. I often see these on my way to Sanibel Island and that is how I was inspired to do this sculpture. 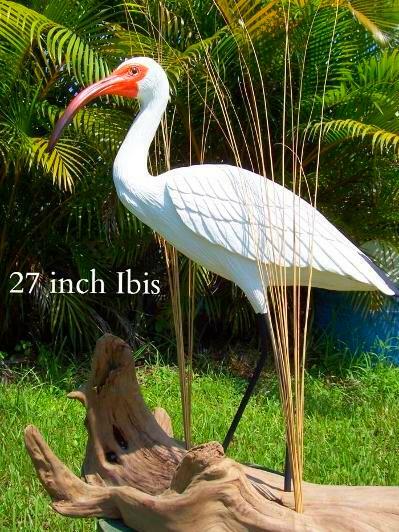 I have named him Sanibel Jack in honor of a good friend who lives on Sanibel.$260.00 Call- 941-286-3299 to order. Roseate spoonbill sculpture 27 inches tall , I start a piece like this by gathering all my reference material to decide on a pose. I then select my wood design and draw my pattern then cut out the basic shape.Then I carve shape and sand until there is nothing left to do but paint . Then I put my base color on and add several thin coats of paint to give a translucent light feel to the feathers that closely mimic a live bird. 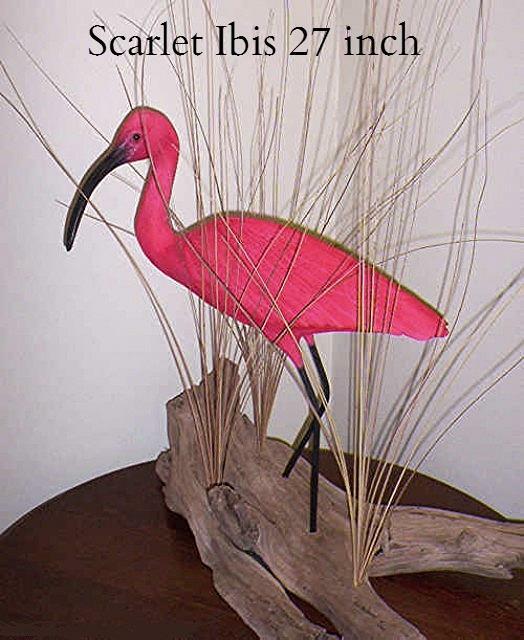 (Ajaia ajaja) - Roseate Spoonbill statue by Rod Becklund ($350.00) Call- 941-286-3299 to order. 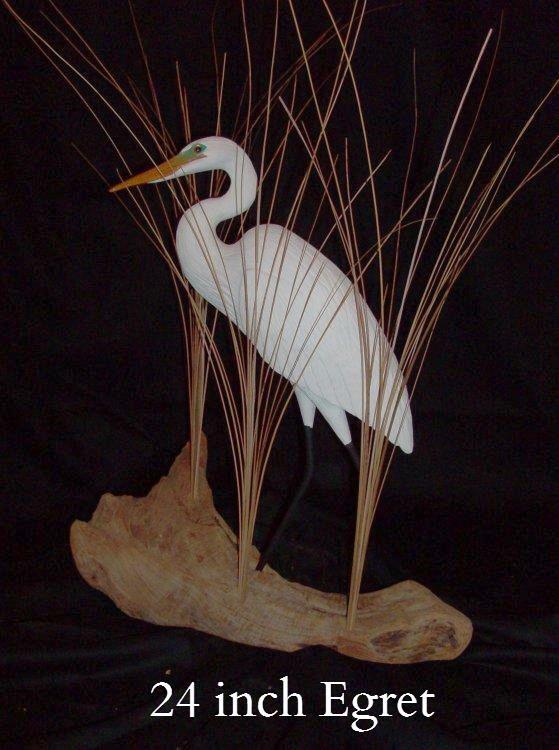 Sandhill Crane (Grus canadensis)32 inches tall on driftwood base with reeds . The Sandhill Crane is a migratory bird and is often seen at golf courses. Sandhill Cranes mate for life and the Chinese hold them in high regard as a symbol of fidelity and loyalty . His name is Terrence the Sandhill. This is a signed and numbered limited edition of 500 $400.00 Call- 941-286-3299 to place your order. A link to Rod Becklund's facebook art page with more art.